We’ve been practising safety of all kinds this week at school. 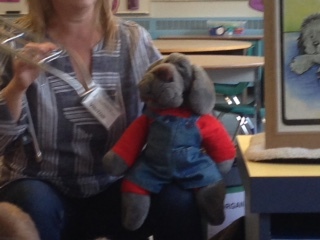 On Wednesday we welcomed Elmer the Elephant and Ruff the Dog. Elmer and Ruff come to us from the North Shore Safety Council. They are puppets, voiced by the amazing Mrs. Young. The children are enchanted with these delightful and endearing puppets. that the children should go shopping with you to purchase their new bike and helmet to ensure everything fits perfectly. Although it’s a wonderful surprise to bring home a special bike for your child, it’s necessary to get a bike that is the right size. A helmet must fit correctly, with the front edge above the eyebrows. The strap should always be fastened under the chin. Slow down and stop your bike, if necessary, for pedestrians if you are riding on the sidewalk. Stop and check before crossing a driveway to see if a car is backing up. Ride in a single file line; a sidewalk is for sharing. Stop your bike at the crosswalk. You get off your bike and walk it across. It is much safer than riding because you do not want to fall down in the middle of the street. Taking a break is ok in the middle of your ride. You could be tired, or there could a lot going on around you such as construction. 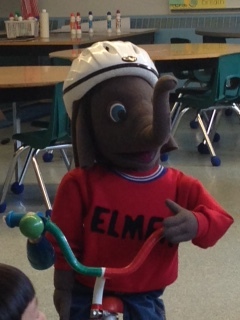 Elmer emphasized to the children that learning to know their limits is part of learning to look after themselves. Look in both directions before you cross the street, and look behind you to see if a car is coming up on your left. A bike carrier or backpack is necessary to carry your things. Ruff explained that the children need to balance and steer their bike with two hands so they need somewhere to store their belongings. Emergency Release can be used in any type of emergency, and this week our school was practising it in conjunction with a simulated Earthquake drill. Although the Kindergarten children are used to listening to follow our directions and instructions for things like class work, lining up or dividing into small groups for PE stations, an Earthquake or Fire Drill is different. This is a emergency situation where the children need to be able follow the teacher’s directions quickly; we tell them that our explanations will be quite abbreviated. We teach the children that we will have to move quickly; we won’t have time to wait for them to finish whatever they might be working on. When it’s time to go, we must go. We have these drills to practise as a school in the event of a real emergency but it also gives us an opportunity to see who can quickly follow our commands in a new situation. We can see how well we have taught our students to listen, follow instructions and focus on what we’re trying to accomplish as a group (get out of the building) instead of our individual needs. 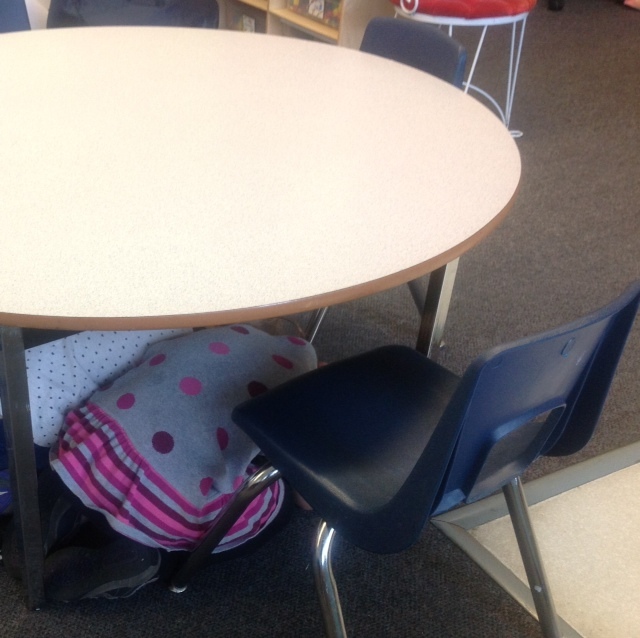 When we heard the signal (rumbling earthquake noises) over the public address system (PA) the children immediately ceased what they were doing to follow our directions of “Duck, Cover and Hold” under the classroom tables. We walked quickly to the tables, mindfully pulled the chairs out and kneeled down under the tables, fingers intertwined and over the back of our necks, elbows covering our ears. We count to 60 as a class, as most earthquakes don’t last more than a minute. Then, we carefully came out from under the tables. Sometimes there might be a few more earthquake noises coming from the PA so we would quickly go back under the tables and begin counting again. We had already taught the children that there can be aftershocks, and to be prepared for a second round of counting. Our Principal, Mrs. Brady, spoke on the PA to ask us to prepare to exit the building. The teacher brings the emergency backpack which is filled with supplies and the children line up behind us. Before we leave our classroom, we place a green “OK” sign in the window so if this was a real emergency situation, staff members would know we were all safe and had left our classroom. Our school population gathers on the gravel field. We complete our attendance and wait to hear if the building is deemed safe by our Damage Assessment Team. In this instance our school was declared safe, and students were allowed to return to the classrooms. Once we were settled, we waited for Student Runners to come and collect the children after their parents had checked in at the Student Release Centre/Parent and Student Reunion Area. We were really proud of the Kindergarten students; they did a fantastic job from the way they walked carefully down to the gravel field, waited patiently for the Damage Assessment Team to finish their survey to staying calm and focused throughout the entire drill. We know that it’s not “if,” but “when” the Big One will come. And when it happens, our practise and preparation with our students means we will be ready.